Pureit Ultima RO + UV by Hindustan Unilever is the latest entrant to the advanced water purifier market. Earlier known for their simple water filters, have now inves ted big to capture a good share in the booming water purifier market. We’ve checked out the Pureit Ultima RO + UV water purifier and must admit that it is quite impressive. Pureit Ultima purifies water with its RO (Reverse Osmosis) + UV (Ultra Violet) technology. 100% of water is processed through a 6 stage purifying technology which includes a pre-sediment filter, pre – RO carbon filter, post-carbon sediment filter, RO membrane, UV reactor and post carbon filter. This ensures all virus, bacteria, chemicals and harmful objects are filtered to output purified water. The body is made of non-toxic engineering grade plastics which is food safe and BPA free. This prevents bad odor and any forms of bacteria. The design is quite sleek with a black front cover and an aluminum strip in the center. Pureit Ultima has a blue lit digital display panel. This is quite informative with all details of water purity indicator, TDS range, water level in the tank and Germkill Kit life. Ultima has all the bells and whistles that reminds you of the germkit replacement 2 weeks ahead of its lifecycle, water purification stops if the filters are not replaced in time. The large tank can hold 10 liters of water, the push button tap is quite neat and blends well with the elegant design. Many people may get confused with the blue colored water, this is due to the illuminated lighting system built in the purifier. The purification germkit-1 is designed to give 4000 liters of water and germkit-2 8000 liters of water approximately. Should I buy a Pureit Ultima.? Well, Pureit Ultima is a well polished product with great features and technology. 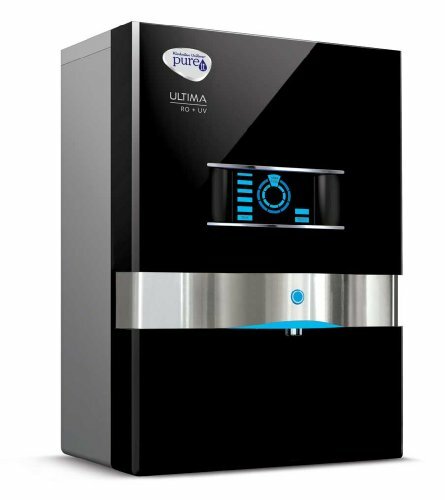 If you are looking for a good water purifier for your family, you can seriously consider Pureit Ultima. When compared to peers, the purifier is a tad above Aquaguard Geneus (Read our review of Aquaguard Geneus here). Kent has a few models in the same range, but they don’t look as neat or elegant as the Pureit or Aquaguard.